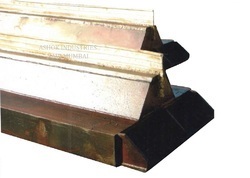 Pioneers in the industry, we offer diaphragm wall square chisel and diaphragm wall grabs from India. The support of a diligent workforce has helped us engage in the manufacture and supply of premium-quality Diaphragm Wall Square Chisel. They are made using highly qualitative raw-materials at our advanced infrastructure facility. They are precision-designed for a perfect finish under the guidance of skilled industry experts. They are renowned for their resistance to corrosion and abrasion. They are tested by highly experienced auditors on several parameters to ensure that they match the expectations of the clients. The usage of advanced tools and machines has helped us facilitate a streamlined manufacturing process. They are compact-sized and portable. Owing to their damage-resistant construction, they are suitable for rugged use. The infrastructure industry forms a major chunk of our clientele. They facilitate ease of installation and have negligible maintenance requirements. Clients can avail them from us in customized specifications at economical prices. We are prominently engaged in manufacturing and supplying highly qualitative Diaphragm Wall Grabs. They are fabricated in compliance with industrial standards of quality by using qualitative raw-materials. Our production process is smooth and organized and this has been possible due to total quality management. These products are highly acclaimed for their damage-resistant features and durable designs. They are quality approved products which are highly demanded by clients from the infrastructure industry. They can be easily installed and have negligible maintenance requirements. They are dimensionally accurate. These products are suitable for repeated use since they do not get damaged easily. We offer them to our esteemed clients at economical prices within the specified time-frame. Customized specifications of the same are also available upon request.